How did the U.S. Air Force respond on 9/11? Could it have shot down United 93, as conspiracy theorists claim? 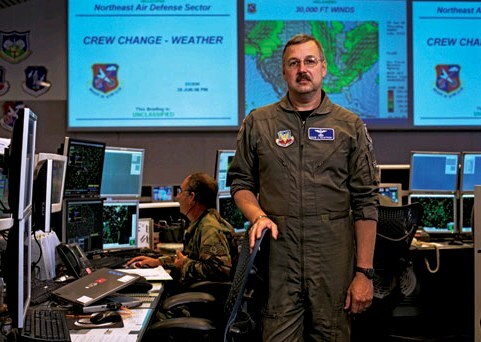 Obtaining 30 hours of never-before-released tapes from the control room of NORAD's Northeast headquarters, the author reconstructs the chaotic military history of that day—and the Pentagon's apparent attempt to cover it up. VF.com exclusive: Hear excerpts from the September 11 NORAD tapes. At 8:14 a.m., as an Egyptian and four Saudis commandeered the cockpit on American 11, the plane that would hit the north tower of the World Trade Center, only a handful of troops were on the NEADS "ops" floor. That's the facility's war room: a dimly lit den arrayed with long rows of radarscopes and communications equipment facing a series of 15-foot screens lining the front wall. The rest of the crew, about 30 Americans and five or six Canadians, were checking e-mails or milling around the hall. A briefing on the morning's training exercise was wrapping up in the Battle Cab, the glassed-in command area overlooking the ops floor. It was the Friday before Memorial Day weekend, 2003, and the hearing room in the Hart Senate Office Building, in Washington, was half empty as the group of mostly retired military brass arranged themselves at the witness table before the 9/11 commission. The story the NORAD officers had come to tell before the commission was a relatively humbling one, a point underscored by the questions commission chairman Thomas Kean introduced during his opening remarks: How did the hijackers defeat the system, and why couldn't we stop them? These were important questions. Nearly two years after the attack, the Internet was rife with questions and conspiracy theories about 9/11—in particular, where were the fighters? Could they have physically gotten to any of the hijacked planes? And did they shoot down the final flight, United 93, which ended up in a Pennsylvania field? Over the next quarter-hour, the fact that the fighters have been launched in response to the phantom American 11—rather than American 77 or United 93—is referred to six more times on Nasypany's channel alone. How could Colonel Scott and General Arnold have missed it in preparing for their 9/11-commission testimony? It's a question Arnold would have to answer later, under oath. This is a full 10 minutes later than the time Major General Arnold and Colonel Scott would give in their testimony; reality was a lot messier. Forty minutes prior, at 8:54 a.m., controllers at Indianapolis Center had lost radar contact with American 77, flying from Washington Dulles to LAX, and assumed the plane had crashed because they weren't aware of the attack in New York. Though they soon realized this was another hijacking and sent warnings up the F.A.A. chain, no one called the military; it was only by chance that NEADS's Watson got the information in her call to Washington Center. Meanwhile, however, NEADS has gotten a call from a NORAD unit in Canada with yet another suspected hijacking headed south across the border toward Washington. In the barrage of information and misinformation, it becomes increasingly difficult for the controllers to keep count of how many suspected hijackings are pending. So far, it is known that three have hit buildings, but given the uncertainty about the fates of American 11 and American 77—no one knows yet that this is the plane that hit the Pentagon—the sense at NEADS is that there are possibly three hijacked jets still out there, and who knows how many more yet to be reported. At this point, no one on the military side is aware that United 93 has been hijacked. In his bunker under the White House, Vice President Cheney was not notified about United 93 until 10:02—only one minute before the airliner impacted the ground. Yet it was with dark bravado that the vice president and others in the Bush administration would later recount sober deliberations about the prospect of shooting down United 93. "Very, very tough decision, and the president understood the magnitude of that decision," Bush's then chief of staff, Andrew Card, told ABC News. In June 17, 2004, a year after the 9/11 commission's initial public hearing, Major General Arnold and a more robust contingent of NORAD and Pentagon brass arrived to testify before the commission at its 12th and final public meeting. This time, they would testify under oath. Azzarello, Farmer, and several other commission members I spoke to dismissed this fog-of-war excuse and pointed out that not only had the military already reviewed the tapes but that the false story it told at the first hearing had a clear purpose. "How good would it have looked for the government in general if we still couldn't have stopped the fourth plane an hour and 35 minutes [into the attack]?" Azzarello asked. "How good would it have looked if there was a total breakdown in communication and nothing worked right?" The Pentagon Lied to cover up..... um.... inepitutide. I'm so glad the 'truth' is coming out at last. Yawn. Washington - Some staff members and commissioners of the Sept. 11 panel concluded that the Pentagon's initial story of how it reacted to the 9/11 terrorist attacks may have been part of a deliberate effort to mislead the commission and the public, according to sources involved in the debate. "We to this day don't know why NORAD (the North American Aerospace Command) told us what they told us," said Thomas Kean, the former New Jersey Republican governor who led the commission. "It was just so far from the truth. ... It's one of those loose ends that never got tied." Although the commission's landmark report made it clear that the Defense Department's early versions of events on Sept. 11 were inaccurate, the revelation that it considered criminal referrals reveals how skeptically those reports were viewed by the panel and provides a glimpse of the tension between it and the Bush administration. A Pentagon spokesman said Tuesday that the inspector general's office would soon release a report addressing whether testimony delivered to the commission was "knowingly false." In fact, the commission reported a year later, audiotapes from NORAD's Northeast headquarters and other evidence showed clearly that the military never had any of the hijacked airliners in its sights and at one point chased a phantom aircraft - American Airlines Flight 11 - long after it had crashed into the World Trade Center. Am listening to a live NPR interview with Journalist Michael Bronner and Colin Scoggins, military specialist, Boston Air Route Traffic Controller, FAA. Pretty tame stuff so far. Journalist Michael Bronner discusses America's military response on the morning of September 11th based on newly released audiotapes from the North American Aerospace Defense Command (NORAD) Northeast headquarters. Oh yeah, that's what I've been hearing this week in the MSM about why Israel is "losing the battle" with Hezbollah. They "weren't prepared." Makes sense to me. How could Israel possibly have known and prepared for a terrorist group to start shooting at it? Who, Israel? HahahahaROFLROFL... They didn't say that with a straight face, surely now? Yes. I almost spit coffee out my nose when I heard it. 1. Have your operatives on one side participate in the op. 2. Blame it's resulting debacle (which is actually your goal) on their "ineptitude". 3. Swing power to opposite side. 4. Rinse and repeat. Ad nauseum. At Boston Center, Colin Scoggins has spotted a low-flying airliner six miles southeast of the White House. So their story is that no one was tracking 77 until it was "six miles east of the White House"?? Norman Mineta: "During the time that the airplane was coming into the Pentagon, there was a young man who would come in and say to the Vice President...the plane is 50 miles out...the plane is 30 miles out....and when it got down to the plane is 10 miles out, the young man also said to the vice president "do the orders still stand?" And the Vice President turned and whipped his neck around and said "Of course the orders still stand, have you heard anything to the contrary!??" Norman Mineta: The flight that came into the Pentagon. The story that Vanity Fair paints is that no one "spotted" Flight 77 until it was six miles east of the White House, due to the plane's beacon being turned off -- and that trying to find one of these "hijacked" planes was like trying to locate "a needle in a haystack" due to the "thousands of green blips" on their scopes. So who was tracking "the plane that hit the Pentagon" when it was reported to be "50 miles out"? Whoever it was certainly didn't have the "needle in a haystack" problem that everyone else seemed to be having that day. Didn't you catch the latest spin from the Cheney camp about that testimony? Someone told me that now they say Cheney was being informed as to the wherabouts of Flight 93, not AA77. So, the big news flash is now that Flight 93 somehow got to within 10 miles of D.C. Then, I guess it turned around and headed back to Shanksville in order to crash. Be on the lookout for a new, cool-looking radar track. And of course, no one seems able to identify any inconsistencies with these stories. It's CSI: Helen Keller. Pentagon 'Told No Lies' ? "The real story is actually better than the one we told,"
contradicted his original testimony. And so it seems. NEW YORK (Reuters) - There is no evidence that senior Pentagon commanders intentionally provided false testimony to about the military's actions on the morning of the September 11 attacks, according to a report by the Defense Department's watchdog agency cited in the New York Times on Saturday. The Pentagon's office of inspector general said the Defense Department's initial inaccurate accounts could be attributed largely to poor record-keeping, the newspaper said in an article on its Web site, citing the newly released report. In a report dated May 27, 2005, but not released until Friday, the inspector general's office found that "the inaccuracies, in part, resulted because of inadequate forensic capabilities," including poor log-keeping at military air traffic control centers, the newspaper said. The report was initially classified secret but was released under a freedom-of-information request by the Times. What amounted to several pages' worth were blacked out on national security grounds, the newspaper said. The Pentagon had initially suggested that the North American Aerospace Defense Command had reacted quickly to reports of the hijackings and been prepared to intercept and possibly shoot down one of the hijacked planes, United Flight 93. But investigations determined that the Pentagon was not aware of Flight 93 until after the aircraft had crashed into a Pennsylvania field. Four widows instrumental in getting Congress to push President Bush to create the 9/11 Independent Commission are insisting that it "failed in its duties" on the heels of two recent news reports which allege that some commissioners knew they were being "deceived" by NORAD officials, and the widows are now questioning "the veracity of the entire Commission’s report," RAW STORY has found. Stalion4: So who was tracking "the plane that hit the Pentagon" when it was reported to be "50 miles out"? Whoever it was certainly didn't have the "needle in a haystack" problem that everyone else seemed to be having that day.